THOSE DIFFICULT TEENAGE years. When discussing Raheem Sterling and the recent furore over his omission from the England team to face Estonia due to being “tired”, it is easy to lose sight of the fact that the Liverpool winger is still only a kid. As well as the burden of having to play well every week, he now faces intrusion and criticism because he did the right thing and told his manager, Roy Hodgson, that he did not perhaps feel right enough to play. “Raheem had done the warm up and said, ‘I really am feeling a bit tired. I am not in my best form at the moment because I’m a bit tired’,” Hodgson revealed at the time, tossing a grenade into the Liverpool camp. Sterling, as a result, has had accusations of laziness and disloyalty thrown at him. As the adverse chanting at QPR proved yesterday, he will now be marked out as The Tired Guy – the man who was too tired to play for England – for the foreseeable future. It all betrays a total lack of understanding and is precisely the type of ignorance that turns wonderkids to has-beens. Hodgson risked another fall-out with Liverpool, his former employers of course, so soon after Daniel Sturridge being injured on international duty. The club claimed that Sturridge was training when he should have been recovering and it is hard not to find dismissiveness in Hodgson’s treatment of the Sterling issue too in regard to Liverpool’s policy of a two-day rest after a game. It is an idea from another time to suggest that, at 19, Sterling should now simply be thrown in and treated like a physically-mature first-team regular. He will end up on the scrapheap if that is to happen. His body is not ready. Sterling is a rare breed of player indeed and needs to remain as such. And in order to stay on track and avoid the pitfalls of injury and fatigue, he must be indulged. It has been a long time since England have had an attacker with that combination of pace, creativity and end product. Hodgson is like any other manager in the sense that he would want to use him as much as possible. That great work Sterling has done has become a burden for him. Too good to leave out for his country while his club struggle to replace both Sturridge due to injury and Luis Suarez. 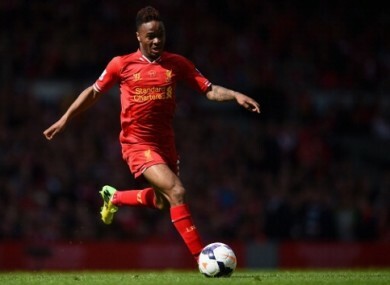 Last season Brendan Rodgers could afford to use Sterling more sparingly. He featured plenty from the bench but only started once in the league before December. It was left to Philippe Coutinho and the likes of Victor Moses and Iago Aspas to supplement Sturridge and Suarez in attack. There was also the lack of European football which gave Liverpool on the whole greater periods of recovery. Now firmly established in the lineup, Liverpool are struggling to give him a rest and gently ease him into the team. There was, for example, widespread bemusement at Rodgers’ decision when Liverpool took to the field for the game against Aston Villa without Sterling and lost. It should have been perfectly understandable. But fans had already lost sight of the fact that Sterling is only a teenager and needed to be managed carefully for the benefit of his long-term health. The Jamaican-born attacker has what renowned fitness coach Raymond Verheijen described to Goal this week as “the same matchday workload” as his team-mates – including those players who are physically mature. That means he will accumulate fatigue faster. Verheijen also made reference to Sterling’s fast muscle fibres. As an explosive player, he would need more time to recover between bouts of activity. Verheijen also said that Sterling runs an added risk of serious injury due to fatigue. “When players have accumulated fatigue, their nervous system slows down and the signal from the brain to the muscles arrives later. For instance, if the muscles that protect the knee fail to contract in time when you are turning – because the signal has arrived a millisecond too late – you can say goodbye to your anterior cruciate ligament.” The fact of the matter is that Sterling is not yet mature enough to deal with the demands asked of him. And what is it going to take for people to realise that? A knee ligament injury that could take away the verve and explosiveness that have characterised his career so far? Sterling found an ally in Ryan Giggs this week. The Manchester United assistant manager advised him to take care of himself first and foremost as it’s a short career. And Giggs should know. As an emerging winger for United in the early 90s, he was thrust in at the deep end and lost many months of what should have been a more dynamic career to various knocks, pulls and strains. Giggs only ever had a half-hearted Wales career and that helped keep fuel in the tank for United. Sterling will end up the same if the management of his situation does not change. Gareth Southgate, the England under-21 manager, has added to the problem by saying that Sterling could well be part of his plans for the European Championships in the Czech Republic next summer. That would have been a unique period for Sterling to recuperate and recharge but his rapid development and importance to every team with whom he plays could be a hindrance. The history of football is littered with examples of those who fulfilled their promise of greatness – from Pele through to Lionel Messi but also those on whom early pressure and demands diminished their impacts – like Antonio Cassano or Adriano. If Liverpool, and indeed England, want to avoid dealing with a 26 or 27 year old burnout, then they would be well advised to ease Sterling in and listen to him. Players know their own bodies better than any coach does and if Sterling says he’s tired, then he’s tired. He has to listen to his body. And those around Raheem Sterling need to listen to him. Email “Bad management turns wonderkids into has-beens - Liverpool must be careful with Sterling”. Feedback on “Bad management turns wonderkids into has-beens - Liverpool must be careful with Sterling”.